In business, everything is about confidence and first impressions. With a Germanicos tailor made business suit, you will exude the kind of confidence that everyone in business aspires to. Let Germanicos take care of dressing you with elegant class and sophistication while you focus on the more important aspects of your business. 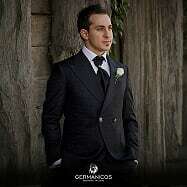 Make your appointment with your own personal tailor at Germanicos. We guarantee a 100% bespoke experience: you have a wide range of choices with the cut, style, colour and the fabric of your tailored business suit. Your business suit will be hand-crafted by the expert bespoke tailors at Germanicos. This product has been most successful with professional consultants, corporate clients and if you’re in this field, you know how important it is to dress right. So don’t hesitate and get your bespoke tailored business suit at Germanicos.